Having considered the origin of auriferous lodes, and the mode by which in all probability the gold was conveyed to them and deposited as a metal, it is necessary also to inquire into the derivation of the gold of our auriferous drifts, and the reasons for its occurrence therein. When quite a lad on the Victorian alluvial fields, I frequently heard old diggers assert that gold grew in the drifts where found. At the time we understood this to mean that it grew like potatoes; and, although not prepared with a scientific argument to prove that such was not so, the idea was generally laughed at. I have lived to learn that these old hard-heads were nearer the truth than possibly they clearly realised, and that gold does actually grow or agglomerate; and, indeed, is probably even now thus growing, though it is likely that the chemical and electric action in the mineral waters flowing through the drifts is not in this age nearly so active as formerly. Most boys have tried the experiment of dipping a clean-bladed knife into sulphate of copper, and so depositing on the steel a film of copper, which adheres closely until worn away. This is a simple demonstration of a hydro-metallurgical process, though probably young hopeful is not aware of the fact; and it is really by an enlargement of this process that our beautiful and artistic gold-and silver-plated ware is produced. In the great laboratory of Nature similar chemical depositions have taken place in the past, and may still be in progress; indeed, there is sound scientific reason to suppose that in certain localities this is even now the case, and that in this way much of our so-called alluvial gold has been formed, that is, by the deposition on metallic bases of the gold held in solution. We will, however, take, to begin with, the generally accepted theory as to the occurrence of alluvial gold. First, let it be said, that certain alluvial gold is unquestionably derived from the denudation of quartz lodes. Such is the gold dust found in many Asiatic and African rivers, in the great placer mines of California, as also the gold dust gained from the beach sand on the west coast of New Zealand, or in the enormous alluvial drifts of the Shoalhaven Valley, New South Wales. Of the first, many fabulous tales are told to account for its being found in particular spots each summer after the winter floods, and miraculous agency was asserted, while the early beachcombers of the Hokitika district found an equally ridiculous derivation for their gold, which was always more plentiful after heavy weather. They imagined that the breakers were disintegrating some abnormally rich auriferous reefs out at sea, and that the resultant gold was washed up on the beach. The facts are simply, with regard to the rivers, that the winter floods break down the drifts in the banks and agitate the auriferous detritus, thus acting as natural sluices, and cause the metal to accumulate in favourable spots; whilst on the New Zealand coast the heavy seas breaking on the shingly beach, carry off the lighter particles, leaving behind the gold, which is so much heavier. These beaches are composed, as also are the "terraces" behind, of enormous glacial and fluvial deposits, all containing more or less gold, and extend inland to the foot of the mountains. It is almost certain that the usually fine gold got by hydraulicing in Californian canyons, in the gullies of the New Zealand Alps, and the great New South Wales drifts, is largely the result of the attrition of the boulders and gravel of moraines, which has thus freed, to a certain extent, the auriferous particles. 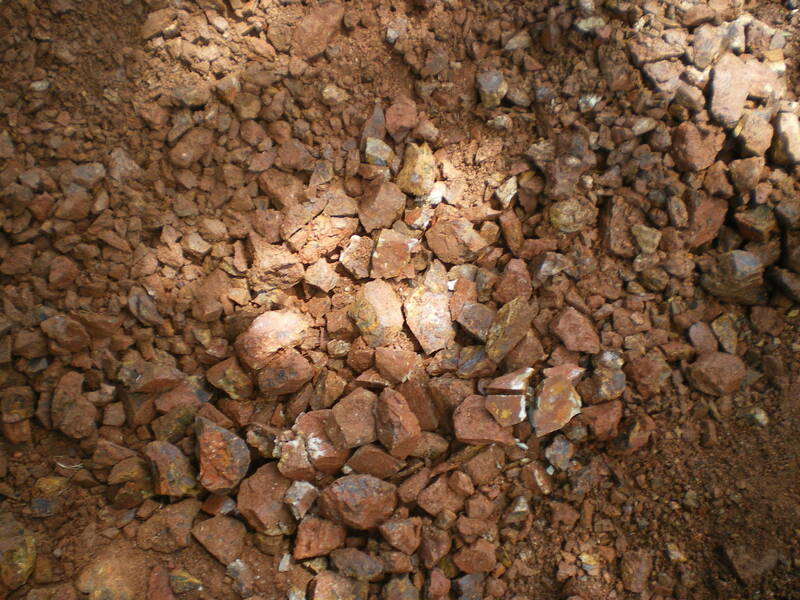 But when we find large nuggety masses of high carat gold in the beds of dead rivers, another origin has to be sought. As previously stated, there is fair reason to assume that at least three salts of gold have existed, and, possibly, may still be found in Nature—silicate, sulphide, and chloride. All of these are soluble and in the presence of certain reagents, also existing naturally, can be deposited in metallic form. Therefore, if, as is contended, reef gold was formed with the reefs from solutions in mineral waters, by inferential reasoning it can be shown that much of our alluvial gold was similarly derived. The commonly accepted theory, however, is that the alluvial matter of our drifts has been ground out of the solid siliceous lodes by glacial and fluvial action, and that the auriferous leads have been formed by the natural sluicing operations of former streams. To this, however, there are several insuperable objections. First, how comes it that alluvial gold is usually superior in purity to the "reef" gold immediately adjacent? Second, why is it that masses of gold, such as the huge nuggets found in Victoria and New South Wales, have never been discovered in lodes? Third, how is it that these heavy masses which, from their specific gravity, should be found only at the very bottom of the drifts, if placed by water action, are sometimes found in all positions from the surface to the bottom of the "wash"? And, lastly, why is it that when an alluvial lead is traced up to, or down from, an auriferous reef, that the light, angular gold lies close to the roof, while the heavy masses are often placed much farther away? Any one who has worked a ground sluice knows how extremely difficult it is with a strong head of water to shift from its position an ounce of solid gold. What, then, would be the force required to remove the Welcome Nugget? Under certain circumstances, Niagara would not be equal to the task. The generally smooth appearance of alleged alluvial gold is adduced as an argument in favour of its having been carried by water from its original place of deposit, and thus in transit become waterworn; while some go so far as to say that it was shot out of the reefs in a molten state. The latter idea has been already disposed of, but if not, it may be dismissed with the statement that the heat which would melt silica in the masses met with in lodes would sublimate any gold contained, and dissipate it, not in nuggets but in fumes. With regard to the assumed waterworn appearance of alluvial gold, I have examined with the microscope the smooth surface of more than one apparently waterworn nugget, and found that it was not scratched and abraded, as would have been the case had it been really waterworn, but that it presented the same appearance, though infinitely finer in grain, as the surface of a piece of metal fresh from the electrical plating-bath. Mr. Daintree, of the Victorian Geological Survey, many years ago discovered accidentally that gold chloride would deposit its metal on a metallic base in the presence of any organic substance. Mr. Daintree found that a piece of undissolved gold in a bottle containing chloride of gold in solution had, owing to a portion of the cork having fallen into the liquid, grown or accretionised so much that it could not be extracted through the neck. This lead Mr. Charles Wilkinson, who has contributed much to our scientific knowledge of metallurgy, to experiment further in the same direction. He says: "Using the most convenient salt of gold, the terchloride, and employing wood as the decomposing agent, in order to imitate as closely as possible the organic matter supposed to decompose the solution circulating through the drifts, I first immersed a piece of cubic iron pyrites taken from the coal formation of Cape Otway, far distant from any of our gold rocks, and therefore less likely to contain gold than other pyrites. The specimen (No. 1) was kept in dilute solution for about three weeks, and is completely covered with a bright film of gold. I afterwards filed off the gold from one side of a cube crystal to show the pyrites itself and the thickness of the surrounding coating, which is thicker than ordinary notepaper. If the conditions had continued favourable for a very lengthened period, this specimen would doubtless have formed the nucleus of a large nugget. Iron, copper, and arsenical pyrites, antimony, galena, molybdenite, zinc blende, and wolfram were treated in the above manner with similar results. In the above experiments a small chip of wood was employed as the decomposing agent. In one instance I used a piece of leather. All through the wood and leather gold was disseminated in fine particles, and when cut through the characteristic metallic lustre was brightly reflected. The first six of these sulphides were also operated upon simply in the solution without organic matter; but they remained unaltered." Wilkinson found that when the solution of gold chloride was as strong as, say, four grains to the ounce of water, that the pyrites or other base began to decompose, and the iron sulphide changed to yellow oxide, the "gossan" of our lodes, and that though the gold was deposited, this occurred in an irregular way, and it was coated with a dark brown powdery film something like the "black gold," often found in drifts containing much ferruginous matter. Such were the curious Victorian nuggets Spondulix and Lothair. Professor Newbery also made a number of similar experiments, and arrived at like results. He states as follows: "I placed a cube of galena in a solution of chloride of gold, with free access of air, and put in organic matter; gold was deposited as usual, in a bright metallic film, apparently completely coating the cube. After a few months the film burst along the edges of the cube, and remained in that state with the cracks open without any further alteration in size or form being apparent. Upon removing it a few days ago and breaking it open, I found that a large portion of the galena had been decomposed, forming chloride and sulphate of lead and free sulphur, which were mixed together, encasing a small nucleus of undecomposed sulphate of lead. The formation of these salts had exerted sufficient force to burst open the gold coating, which upon the outside had the mammillary form noticed by Wilkinson, while the inside was rough and irregular with crystals forcing their way into the lead salts. Had this action continued undisturbed, the result would have been a nugget with a nucleus of lead salts, or if there had been a current to remove the results of decomposition, a nugget without a nucleus of foreign matter." But Newbery also made another discovery which still further establishes the probability of the accretionary growth of gold in drifts. In the first experiments both investigators used organic substances as the reagent to cause the deposit of gold on its base, and in each case these substances whether woodchips, leather, or even dead flies, were found to be so absolutely impregnated with gold as to leave a golden skeleton when afterwards burned. Timber found in the Ballarat deep leads has been proved to be similarly impregnated. Newbery found that gold could also be deposited on sulphurets without any other reagent. He says: "In our mineral sulphurets, however, we have agents which are not only capable of reducing gold and silver from solution, but besides are capable of locating them when so reduced in coherent and bulky masses. Thus the aggregation of the nuggety forms of gold from solution becomes a still more simple matter, only one reagent being necessary, so that there is a greater probability of such depositions obtaining than were a double process necessary. Knowing the action of sulphides, the manner or the mode of formation of a portion at least of these nuggets seems apparent. Conceive a stream or river fed by springs rising in a country intersected by auriferous reefs, and consequently in this case carrying gold in solution; the drift of such a country must be to a greater or lesser extent pyritous, so that the debris forming the beds of these streams or rivers will certainly contain nodules of such matters disseminated or even stopping them in actual contact with the flow of water. It follows, then, from what has been previously affirmed, that there will be a reduction of gold by these nodules, and that the metal thus reduced will be firmly attached to them, at first in minute spangles isolated from each other, but afterwards accumulating and connecting in a gradual manner at that point of the pyritous mass most subject to the current until a continuous film of some size appears. This being formed the pyrites and gold are to a certain extent polarised, the film or irregular but connected mass of gold forming the negative, and the pyrites the positive end of a voltaic pair; and so according as the polarisation is advanced to completion the further deposition of gold is changed in its manner from an indiscriminate to an orderly and selective deposition concentrated upon the negative or gold plate. The deposition of gold being thus controlled, its loss by dispersion or from the crumbling away of the sustaining pyrites is nearly or quite prevented, a conservative effect which we could scarcely expect to obtain if organic matter were the reducing agent. Meanwhile there is a gradual wasting away of the pyrites or positive pole, its sulphur being oxidised to sulphuric acid and its iron to sesquioxide of iron, or hematite, a substance very generally associated with gold nuggets. According to the original size of the pyritous mass, the protection it receives from the action of oxidising substances other than gold, the strength of the gold solution, length of exposure to it, the rate of supply and velocity of stream, will be the size of the gold nugget. As to the size of a pyritous mass necessary to produce in this manner a large nugget, it is by no means considerable. A mass of common pyrites (bisulphide of iron) weighing only 12 lbs. is competent for the construction of the famous 'Welcome Nugget,' an Australian find having weight equal to 152 lbs. avoirdupois. Such masses of pyrites are by no means uncommon in our drifts or the beds of our mountain streams. Thus we find that no straining of the imagination is required to conceive of this mode of formation for the huge masses of gold found in Australia in particular, such as the Welcome Nugget, 184 lbs. 9 oz. ; the Welcome Stranger, a surface nugget, 190 lbs. 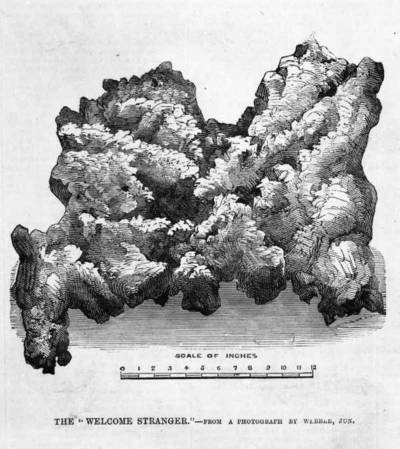 after smelting; the Braidwood specimen nugget, 350 lbs., two-thirds gold; besides many other large masses of almost virgin gold which have been obtained from time to time in the alluvial diggings." The author has made a number of experiments in the same direction, but more with the idea of demonstrating how possibly gold may in certain cases have been deposited in siliceous formations after such formations had solidified. Some of the results were remarkable and indeed unexpected. I found that I could produce artificial specimens of auriferous quartz from stone which had previously contained no gold whatever, also that it was not absolutely necessary that the stone so treated should contain any metallic sulphides. "The question as to how gold was originally deposited in our auriferous lodes is one to which a large amount of attention has been given, both by mineralogists and practical miners, and which has been hotly argued by those who held the igneous theory and those who pronounced for the aqueous theory. It was held by the former that as gold was not probably existent in nature in any but its metallic form, therefore it had been deposited in its siliceous matrix while in a molten state, and many ingenious arguments were adduced in support of this contention. Of late, however, most scientific men, and indeed many purely empirical inquirers (using the word empirical in its strict sense) have come to the conclusion that though the mode in which they were composed was not always identical, all lodes, including auriferous formations, were primarily derived from mineral-impregnated waters which deposited their contents in fissures caused either by the cooling of the earth's crust or by volcanic agency. "The subject is one which has long had a special attraction for the writer, who has published several articles thereon, wherein it was contended that not only was gold deposited in the lodes from aqueous solution, but that some gold found in form of nuggets had not been derived from lodes but was nascent in its alluvial bed; and for this proof was afforded by the fact that certain nuggets have been unearthed having the shape of an adjacent pebble or angular fragment of stone indented in them. Moreover, no true nugget of any great size has ever been found in a lode such as the Welcome, 2159 oz., or the Welcome Stranger, 2280 oz. ; while it was accidentally discovered some years ago that gold could be induced to deposit itself from its mineral salt to the metallic state on any suitable base, such as iron sulphide. "Following out this fact, I have experimented with various salts of gold, and have obtained some very remarkable results. I have found it practicable to produce most natural looking specimens of auriferous quartz from stone which previously, as proved by assay, contained no gold whatever. Moreover, the gold, which penetrates the stone in a thorough manner, assumes some of the more natural forms. It is always more or less mammillary, but at times, owing to causes which I have not yet quite satisfied myself upon, is decidedly dendroidal, as may be seen in one of the specimens which I have submitted to members. Moreover, I find it possible to moderate the colour and to produce a specimen in which the gold shall be as ruddy yellow as in the ferro-oxide gangue of Mount Morgan, or to tone it to the pale primrose hue of the product of the Croydon mines. "I note that the action of the bath in which the stone is treated has a particularly disintegrating effect on many of the specimens. Some, which before immersion were of a particularly flinty texture, became in a few weeks so friable that they could be broken up by the fingers. So far as my experiments have extended they have proved this, that it was not essential that the silica and gold should have been deposited at the one time in auriferous lodes. A non-auriferous siliceous solution may have filled a fissure, and, after solidifying, some volcanic disturbance may have forced water impregnated with a gold salt through the interstices of the lode formation, when, if the conditions were favourable, the gold would be deposited in metallic forms. I prefer, for reasons which will probably be understood, not to say exactly by what process my results are obtained, but submit specimens for examination. "(1) Piece of previously non-gold bearing stone. Locality near Adelaide, now showing gold freely in mammillary and dendroidal form. "(2) Stone from New South Wales, showing gold artificially introduced in interstices and on face. "(3) Stone from West Australia, very glassy looking, now thoroughly impregnated with gold; the mammillary formation being particularly noticeable. "(4) Somewhat laminated quartz from Victoria, containing a little antimony sulphide. In this specimen the gold not only shows on the surface but penetrates each of the laminations, as is proved by breaking. "(5) Consists of fragments of crystallised carbonate of lime from Tarrawingee, in which the gold is deposited in spots, in appearance like ferrous oxide, until submitted to the magnifying glass. "The whole subject is worthy of much more time than I can possibly give it. The importance lies in this: That having found how the much desired metal may have been deposited in its matrix, the knowledge should help to suggest how it may be economically extracted therefrom." A very remarkable nugget weighing 16 3/4 oz. was sluiced from near the surface in one of my own mining properties at Woodside, South Australia, some years ago, which illustrated the nuclear theory very beautifully. This nugget is very irregular in shape, fretted and chased as though with a jeweller's graving tool, showing plainly the shape of the pyritous crystals on which it was formed while the interstices were filled with red hematite iron just as found in artificially formed nuggets on a sulphide of iron base. The author has a nugget from the same locality weighing about 1 1/2 oz. which exhibits in a marked degree the same characteristics, as indeed does most of the alluvial gold found in the Mount Lofty Ranges; also a nugget from near the centre of Australia weighing four ounces, in which the original crystals of pyrites are reproduced in gold just as an iron horse-shoe, placed in a launder through which cupriferously impregnated water flows, will in time be changed to nearly pure copper and yet retain its shape. Now with regard to the four points I have put as to the apparent anomalies of occurrence of alluvial gold. The reason why alluvial gold is of finer quality as a rule than reef is probably because while gold and silver, which have a considerable affinity for each other, were presumably dissolved from their salts and held in solution in the same mineral water, they would in many cases not be deposited together, for the reason that silver is most readily deposited in the presence of alkalies, which would be found in excess in mineral waters coming direct from the basic rocks, while gold is induced to precipitate more quickly in acid solutions, which would be the character of the waters after they had been exposed to atmospheric action and to contact with organic matters. This, then, may explain not only the comparatively greater purity of the alluvial gold, but also why big nuggets are found so far from auriferous reefs, and also why heavy masses of gold have been frequently unearthed from among the roots even of living trees, but more particularly in drifts containing organic matter, such as ancient timber. All, then, that has been adduced goes to establish the belief that the birthplace of our gold is in certain of the earlier rocks comprising the earth's crust, and that its appearance as the metal we value so highly is the result of electro-chemical action, such as we can demonstrate in the laboratory.